With the myriad of data sets and use cases available in the LOD cloud, data quality is one of the important concepts to be considered. 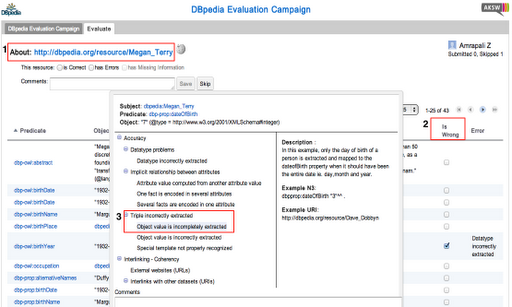 The DBpedia Data Quality Curation project is aimed at evaluating the quality of the resources present in DBpedia. However, not all the data quality problems are automatically detectable. Thus, we aim at crowd-sourcing the quality assessment of the dataset. In order to perform this assessment, we developed a tool whereby a user can evaluate a random resource by analyzing each triple individually and store the results. Here is the link to the tool: http://nl.dbpedia.org:8080/TripleCheckMate/.